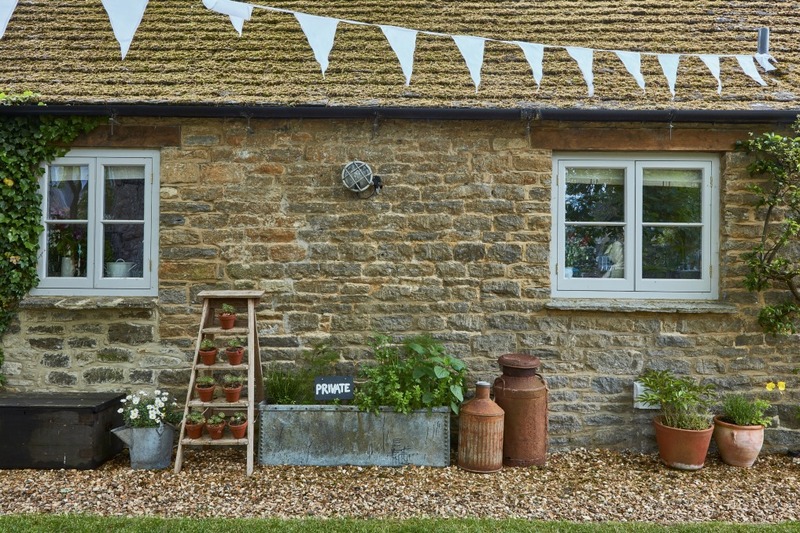 On a tiny island in the Cotswolds of England lies Filly Island and this charming cottage. This tiny 35 foot x 10 foot structure has lived many lives including it’s original use in the 1750’s when it housed a cart that a horse pulled for the mill up the stream. It later became storage space for apples from the village orchard and later a garage and play house for the local kids – who are now 80+ years old! 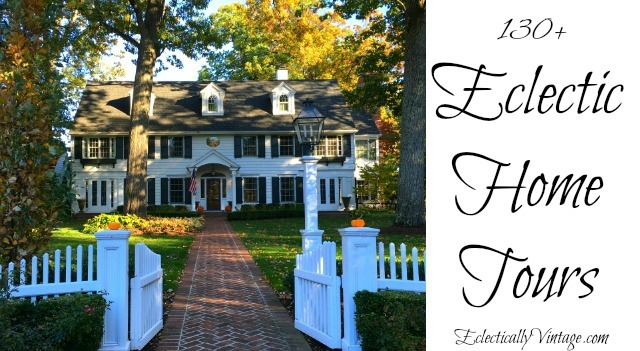 This is the first Eclectic Home Tour of 2017 but one of 100’s of stunning homes in my Eclectic Home Tour Gallery – be sure to swing back to check out you’re favorites. 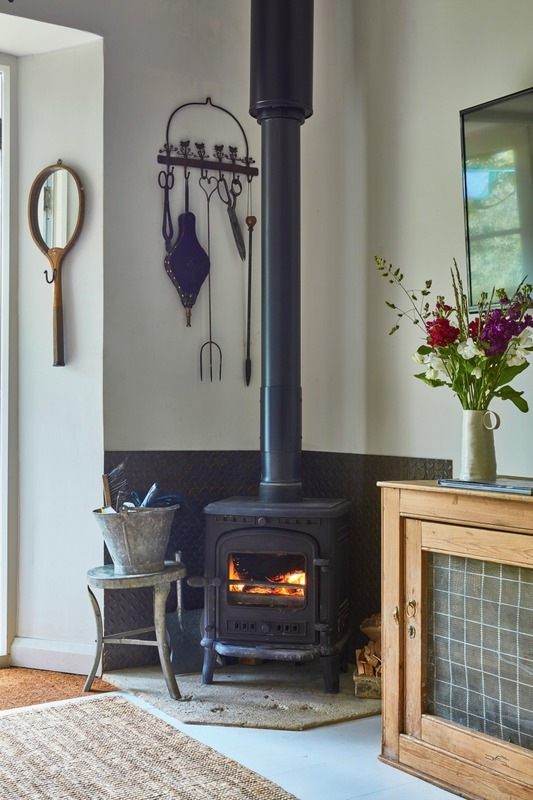 Did I mention this charming cottage is available to rent – find more info at the end of the post but first let’s cross over this charming foot bridge to reach Filly Island. 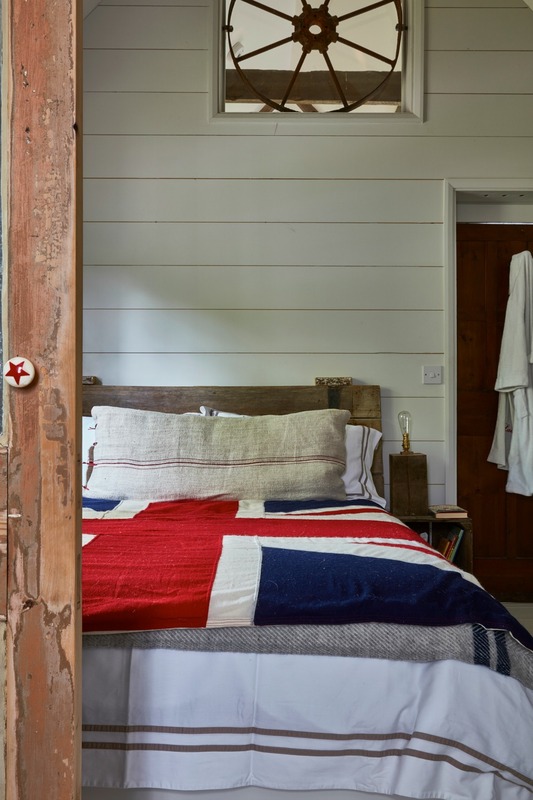 The owner says, “Care was taken during the renovation to reuse anything that could be and other materials were locally sourced. 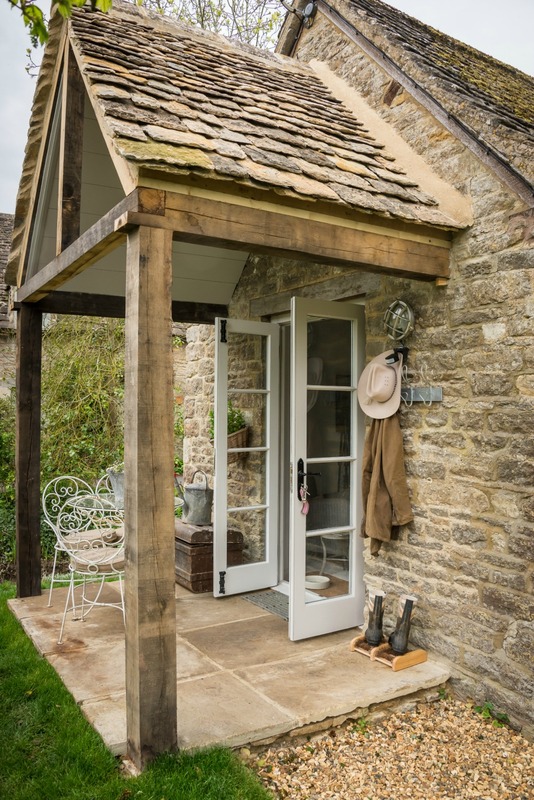 The roof is original old Cotswold tiles, the porch is reclaimed oak” (leftovers from the porch are now lamps in the house). Old barn doors were cut down and repurposed as kitchen cabinet doors. 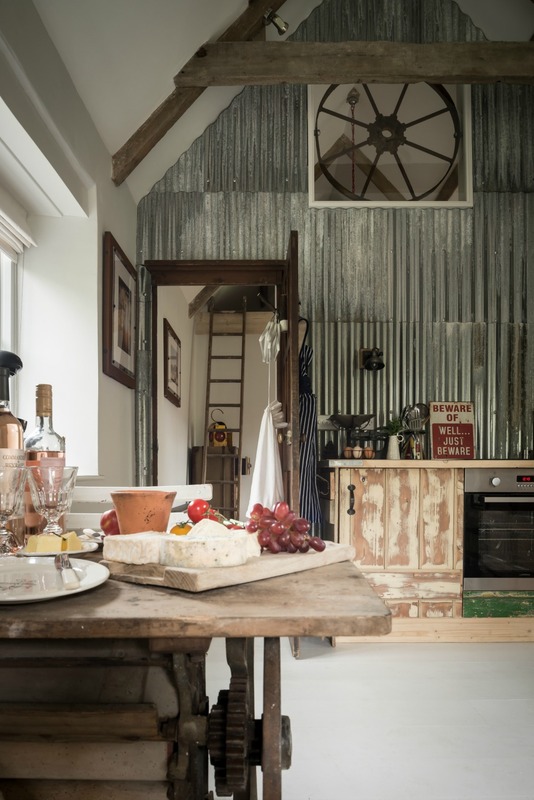 Corrugated metal makes a unique focal wall. A pair of old fire buckets turned pendant lights. 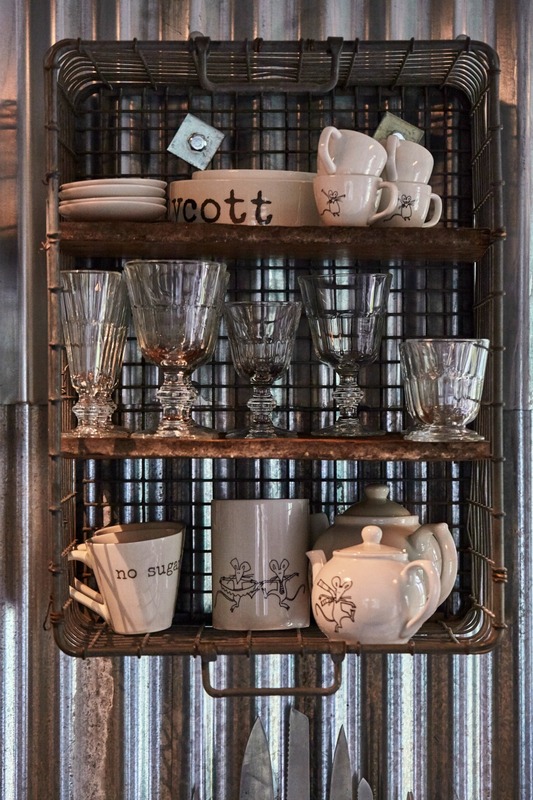 I love all the little details including this old crate for storing kitchen essentials. Even the sofa got a new lease on life – it was found at the local dump. 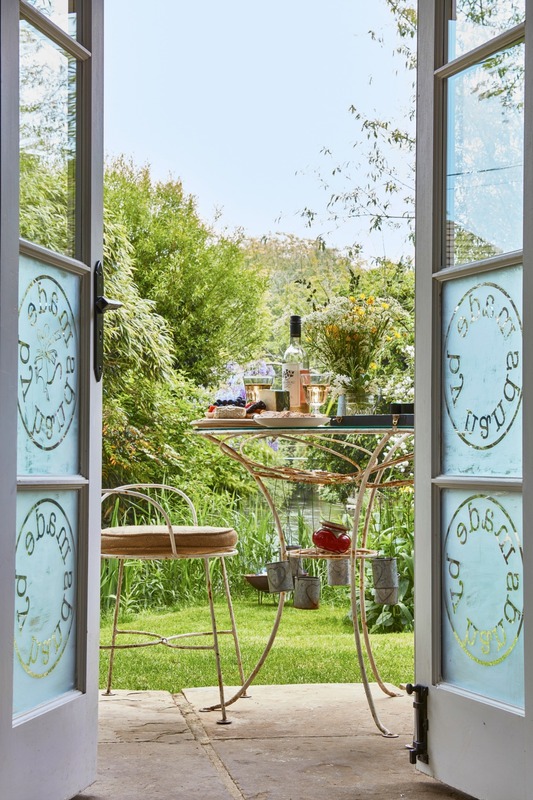 Etched glass doors spill out onto the gardens – the perfect place for a spot of tea … or a bottle of wine. 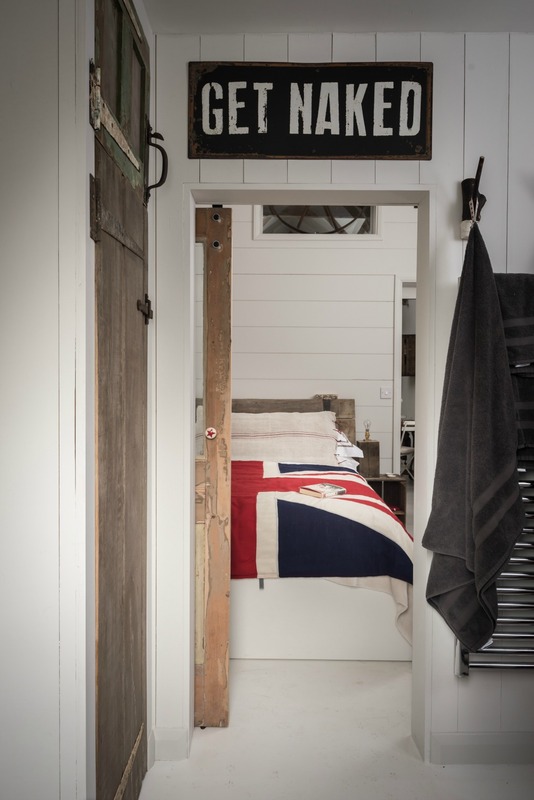 The cart wheel above the bed dates back to the industrial revolution! 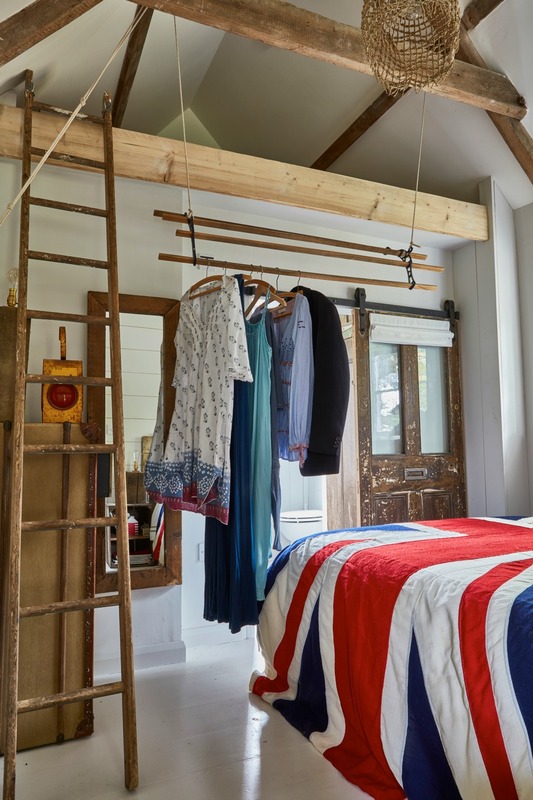 A pulley system stands in for a closet. 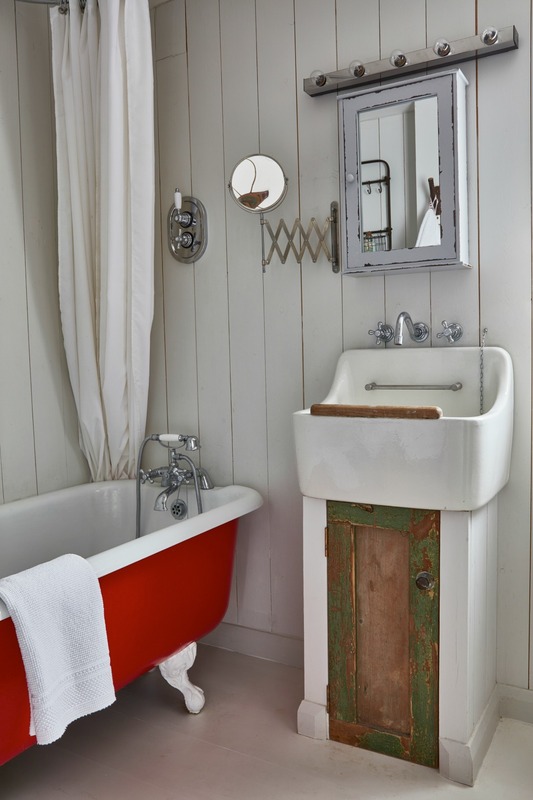 The bathtub was found in a bush, hauled home and given a bright red paint job. 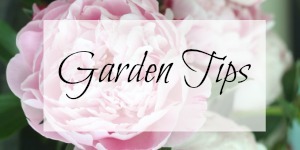 Attention to detail abounds – even outside. Why am I suddenly in the mood to book a getaway to Filly Island? It’s available to rent through Unique Home Stays or call them at +44(0) 1637 881183. 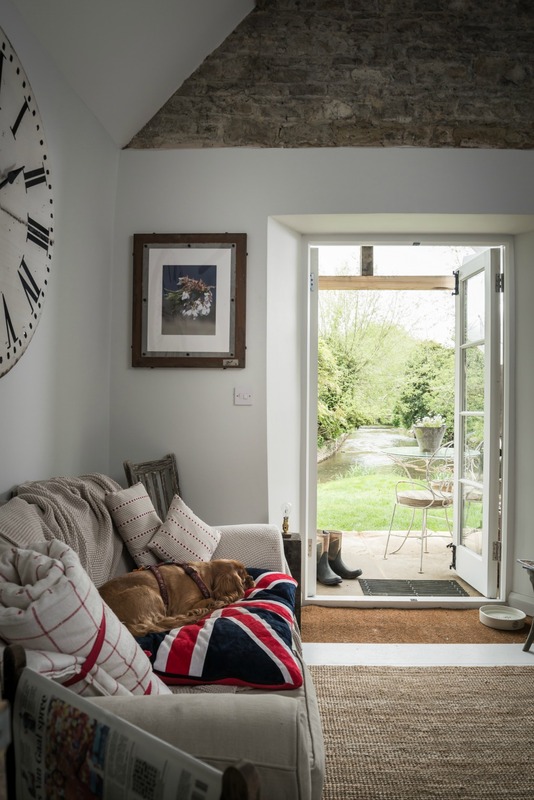 A bit too rustic for me but I love the idyllic property and the white floors (I just painted my office wood floor white). Happy New Year! I love the painted floors too Mary Beth and happy new year to you too! Such a charming and inviting place! Love all the “finds” used! They did such an amazing job with the reno Linda! 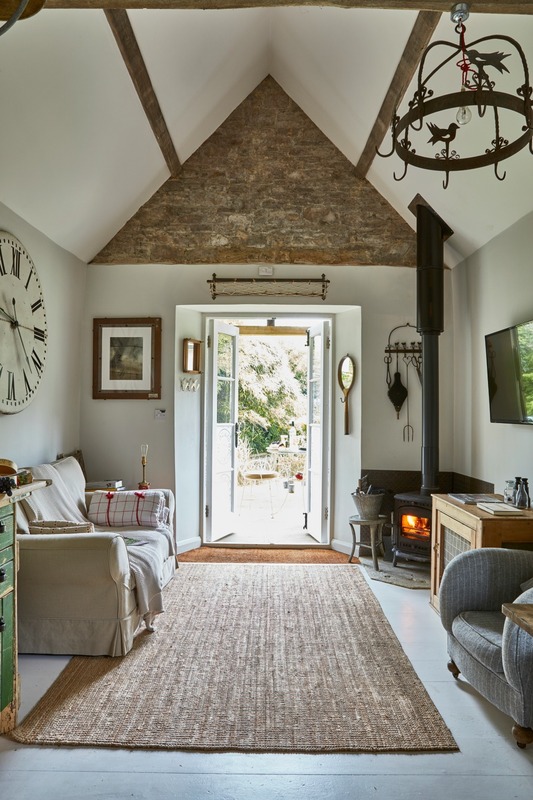 Kelly, I love everything about this cottage. Simply beautiful. Love that red bathtub! Can you believe they found the tub in the bushes! Oh I’d love to stay there for awhile! Whimsical and charming…I could live there! Thanks for sharing! I want to go! That is the cutest place ever. I want the pottery with the dancing mice. Such a charming place in such a charming setting! I love the pottery too – they thought of everything! Fabulous! I love it!!! Wow!!! So unique and cozy, wonderful place to spend some time. I need a vacation here pronto! I can picture myself there too Mary! What a great place! Love that they use found objects. Thanks for sharing ! 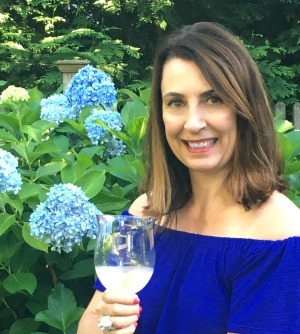 Me too Patty – so many cool finds! Love it ! So unique ! 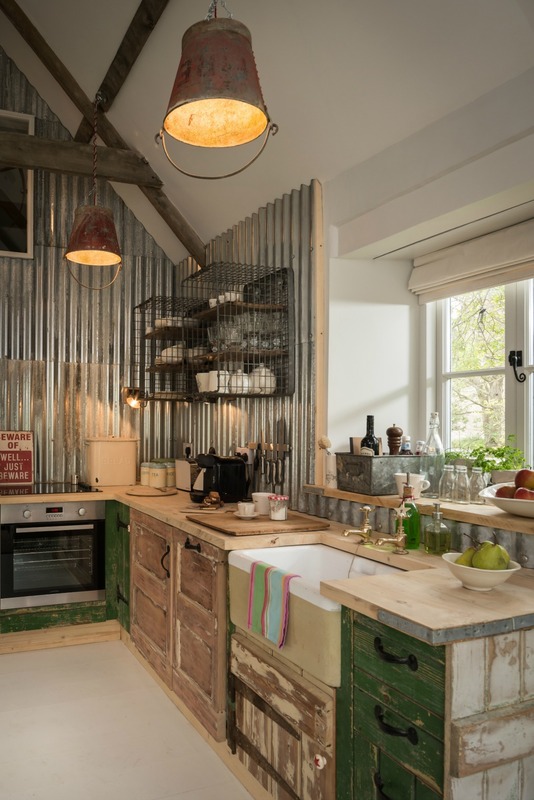 Like the rustic look ! It’s such a unique home Cindy – perfect for a vacation! 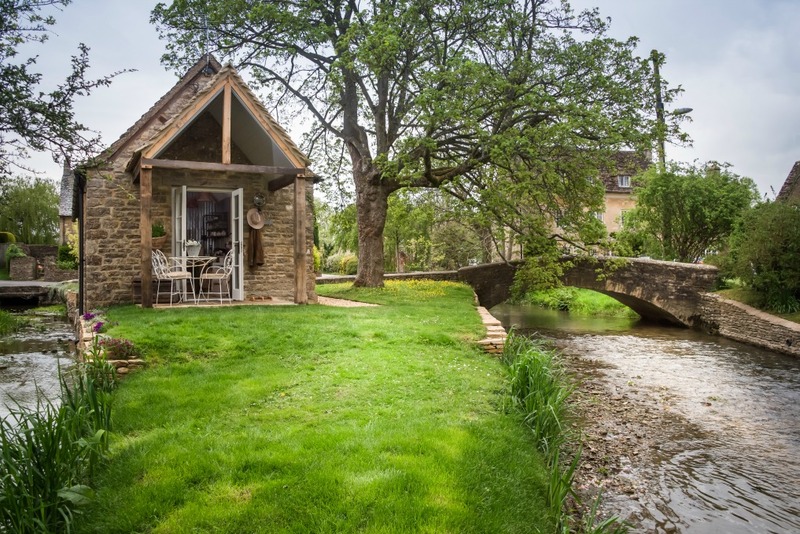 Oh my, I love this little cottage. I’m drooling over the window ledge above the kitchen sink! I just comeback to Argentina, my country! I love your works! All your’s projects! Wow, what a cozy retreat getaway! Love all the attention to detail in every corner of every room. Would love to know details to explore a rental? So lovely and inviting. I want to go! Beautiful. 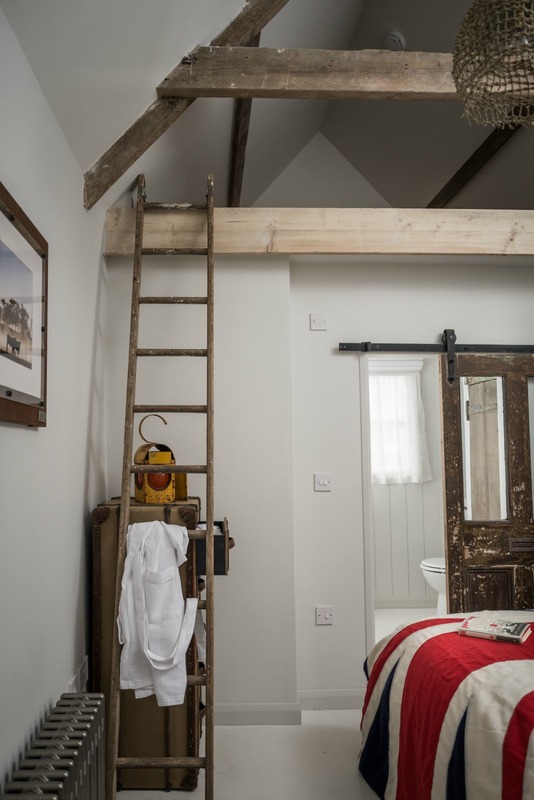 If you could send rough measurements for your lovely cottage. Most of the tiny homes here in the states are using lofts for the bedroom. I am disabled and unable to climb stairs to bed, but we want to scale down as almost-empty-nesters! 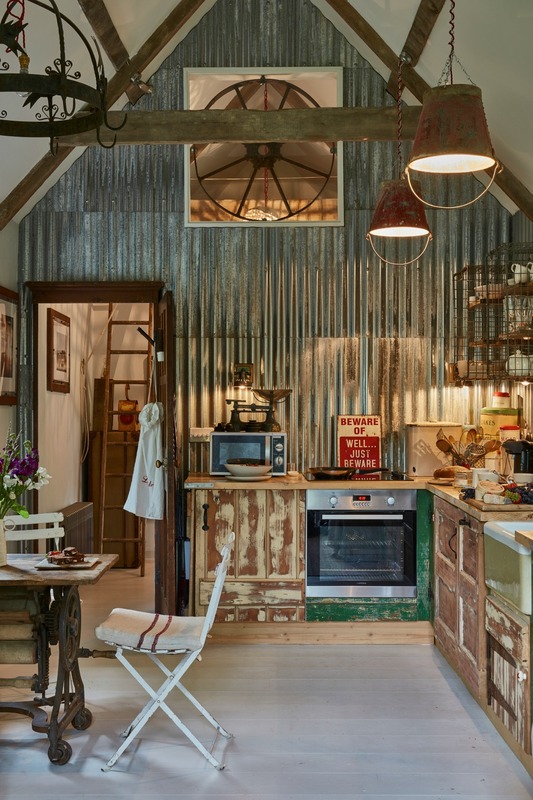 I also love your use of recycled and local materials for your charming cottage! Love the creativity and good use of all these items! Beautiful. This is kinda what my husband started with an old small duplex, made it into a single home, added a loft and a few bedrooms in the attic. Now we have been married nearly 3 yes. Living in it for only a year. Alot more to go but each step is worth it. I have been taking pictures of all the progress inside and out. Thank you for sharing. Just spent a week at Filly Island in July. The whole experience was magical. The Hostess, Mouse, was a delight, we want to go back next year.